Far Cry 5 is out, and we'll be brutally honest: Liberating Hope County isn't easy. Project at Eden's Gate has the entire map locked down, and it's up to Rook to figure out how to liberate the county. Luckily, there's plenty of perks to help out. 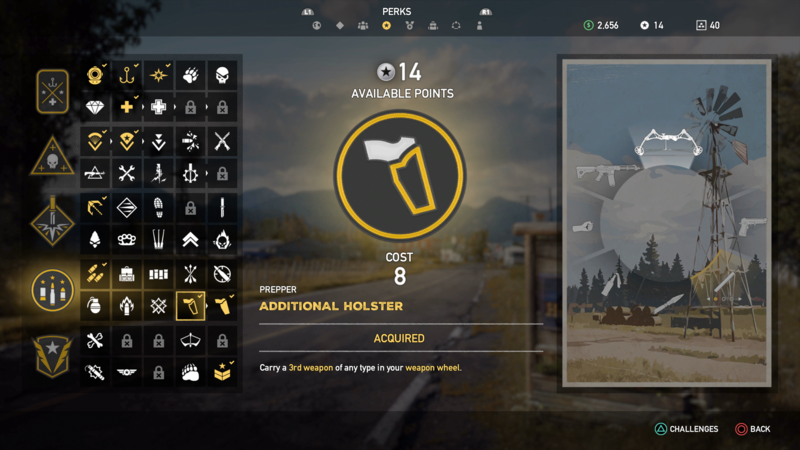 Perks are purchased through perk points, which are obtained through completing challenges, finding Prepper Stashes, or hanging out in the Far Cry Arcade. Once you begin earning points, you can start spending your stockpile on perks. Here's our recommendations for the best perks for beginners to pick up in the game. 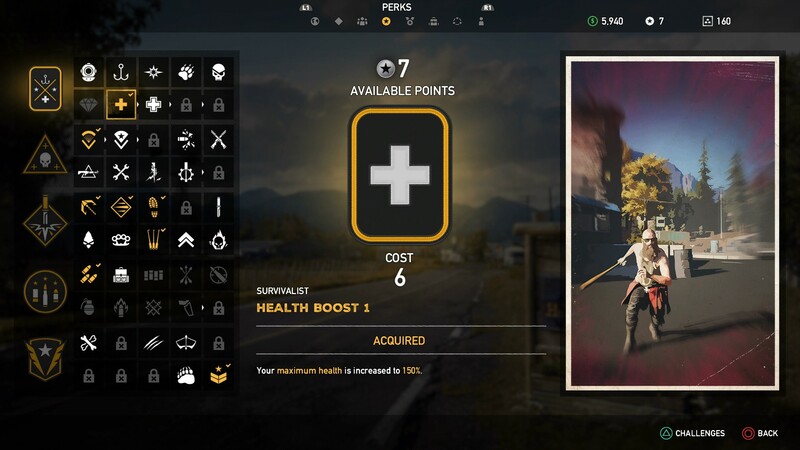 One of the most self-explanatory perks throughout Far Cry 5, Health Boost 1 boosts players' health to 150 percent. This is particularly vital early on, as it lets players absorb a bit more damage from Peggies: Particularly when it comes to Peggie rockets, grenades, and sniper fire. You'll need six points to buy the first Health Boost, after which there's three more Health Boost perks. Each one increases by 50 percent but requires an additional point, with up to 300 percent health at Health Boost 4 for nine Perk Points. In Far Cry 5, players live and die by their medkits. That's particularly true when it comes to the game's story missions, which often feature intense confrontations between cultist hordes across outposts. As the game progresses, a stray grenade or rocket can quickly become a life-or-death situation. And that means players need to come into fights prepared. The Journey Pack works pretty well for one simple reason: It lets players store up to five medkits while walking around. 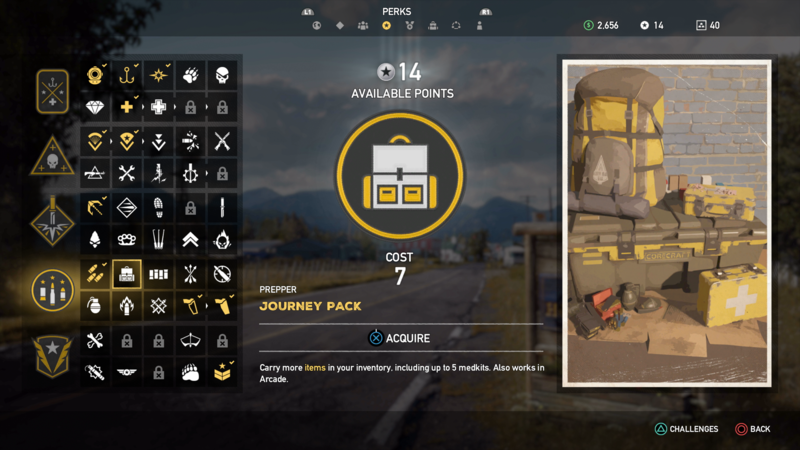 As medkits are ridiculously cheap at shops, and they can even be found while scavenging around Hope County, buying the Journey Pack is an excellent early opportunity to prevent needless in-game deaths. Otherwise, players are forced to rely on their regenerating health to rebound from heavy fire, and against a flamethrowing Peggie or a bomb, well, a medkit is always a better option. This one will cost you seven points. While you might not be hanging out in your vehicle for very long in Far Cry 5, it's easy to find yourself stranded after an intense fight with heavily armed Peggie vehicles. 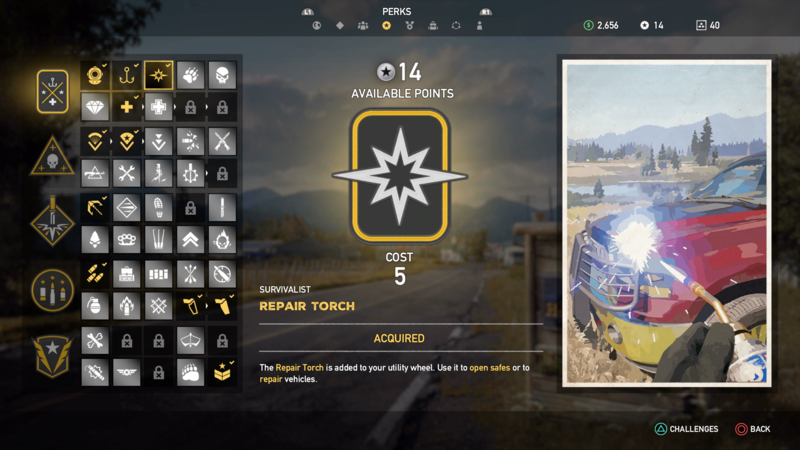 Grabbing the Repair Torch perk lets players repair damaged vehicles back to life, reinforcing a car, helicopter, or plane's health. This means players can repair their ride as well as abandoned Peggie vehicles. And the torch can even be used to bust into safes, too. There's a couple caveats to keep in mind with the Repair Torch. It'll cost you five points, which means it's not an expensive upgrade, but it's not the cheapest. The torch can't bring totaled cars back to life, either. So if you destroy a Peggie vehicle with an RPG, there's no way you're driving that rusted hulk back to a Resistance outpost. But otherwise, the Repair Torch makes for a smart investment early in the game. Easily one of the most important perks to grab early in the game, the Additional Holster lets players take along a second primary weapon. There's no limits in that regard, which means players can bring along two sniper rifles, a flamethrower and a carbine, an additional pistol, an SMG and a rocket launcher, or any other combination of primary weapons they see fit. Having a second primary weapon holster lets players balance out their weapons offerings without relying immediately on their primary. With a sniper rifle and a carbine, for instance, players can seamlessly switch from long-range to mid-range fire during a fight. Meanwhile, tagging an RPG alongside an SMG assures players can fight in short-range combat and take down incoming Peggie vehicles. While the Additional Holster is expensive—it'll set you back eight points—grabbing it also lets players earn the Weapons Collector perk after they've defeated one of Eden's Gate's three lieutenants: Faith, John, or Jacob.